Though MSNBC is my preferred station for news and analysis, I have to acknowledge a little personal frustration with the folks in charge of the network. I still don't understand why MSNBC can't be a 24/7 news channel like its competitors at Fox and CNN. I mean, I love those prison shows, but how about creating an all prison channel for them (and while we're at it, can A&E just create an all hoarding channel, too? I sense big ratings from something like that.)? No more Dateline pervs, no more Caught on Camera, how about 24/7 news and news oriented stuff. I also have to say that it has been quite a blow for me, personally, to lose Savannah Guthrie, Norah O'Donnell, and Contessa Brewer from the line-up, all in a span of a few months. Nothing against Martin Bashir, but he is not a sufficient replacement. 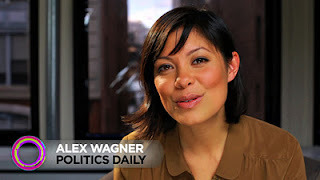 Things could be moving in a better direction now that Alex Wagner is getting her own show. I won't lie and say that I don't find her quite easy on the eyes, but the main reason I'm happy about the decision is that it is a move toward younger, sharper people on the network. Wagner will join folks like Rachel Maddow and Chris Hayes; and their analysis is not stuck in the 1960s. It is so frustrating listening to TV bloviators try and relate every current political issue back to the 1960s. Ah, the glorious 1960s - the only decade that mattered. Ever. At least you'd think that if you watched Chris Matthews or Lawrence O'Donnell (no disrespect to them, as I watch them both). As a child of the 80s, I'd personally not prefer to hear from political pundits that every thing has already been done - 50 years ago. That is what attracted me to Maddow in the first place. Her references are rooted in the 80s and 90s and seem much more relevant. Hayes, too. I'm guessing, based on her many appearances on MSNBC in the past, that Alex Wagner will also not find herself stuck in the "JFK is the best ever, and you youngins just don't understand" school of punditry. So, congratulations to Alex Wagner for getting her own show, and congrats to MSNBC for not hiring a grey haired child of the 60s. Now if they'll just get rid of Ed Schultz, Al Sharpton, and Chris Matthews. I agree with the sentiment that MSNBC needs to go 24/7 and ditch the NBC crapolla. They won't get rid of Ed because his ratings are going up, and they moved him ahead two hours. Sharpton is too new. I watch Matthews, but would not miss him too much if he went away. I think Ed Schultz has done a lot of good, especially when it comes to stuff like what's going on in Wisconsin. He provides a good bridge between the heartland and progressives.